Earlier this month we have seen the Android 9.0 Pie Beta update rolling out for the Xiaomi Mi A2 in the regions of Asia; more specifically in India. The OTA update zip has already been captured and ready to install on other devices. However, the installation procedure is not for everyone as it is quite complex. Now, you can simply go to settings > system updates > and download the update across the globe. 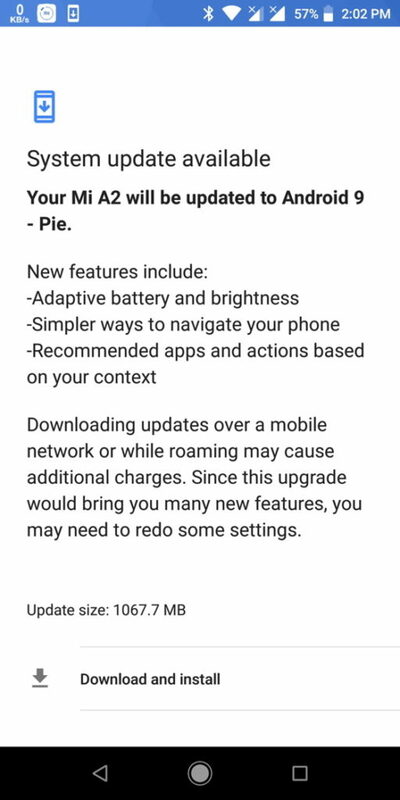 Yes, the official stable Android 9.0 Pie OTA update is now rolling out for the Xiaomi Mi A2. Xiaomi is now rolling out stable build of Android 9 towards Mi A2 devices. The Android Pie beta program is over; and shorter than we have expected. The new Android One firmware is quite stable and the changelog is same as before. As per the update log goes, it features adaptive battery and brightness, new navigation system, recommended apps and actions, and all the Android Pie goodies. Moreover, according to the users (in source) – the update features new Gesture Navigation system from Google, App Actions, Slice, latest Security Patch level from AOSP, new Accessibility Menu, Screenshot Shortcut, new Screen Rotation option in navigation bar, Dark Mode support, Text Selection in overview mode, advanced notifications, and Digital Wellbeing support as well. The OTA comes around 1 GB in a size or 1067.7 Mb to be precise. It also features the latest November 5, 2018 Security Patch based on Android version 9 Pie. The update also reveals a new launcher similar to the latest Pixel 3 Launcher. The new update may also feature support for the new camera 2 API to install the latest Google Camera 6.1 from Pixel 3. Test it yourself.